This comprehensive annual tax planning guide explains how to pay less income tax, capital gains tax and inheritance tax. It is essential reading for anyone who wants to cut their tax bill, including salary earners, business owners, landlords and private investors. Crammed full of tax saving ideas, How to Save Tax 2019/20 is written in plain English and contains easy to follow advice and examples. With 174 pages of tax planning tips, this guide comes FREE with any purchase from Taxcafe. The 24th edition has just been published (April 2019) and is completely up to date for the current tax year. All tax changes announced in the October 2018 Budget and March 2019 Spring Statement. Details of future tax changes coming in 2020/21 and later tax years. How to split your income with your spouse/partner and save thousands in tax. How to avoid the child benefit charge. Full details of the new Scottish income tax regime. How to invest tax free - a guide to the best tax shelters, including venture capital trusts, enterprise investment schemes and the seed enterprise investment scheme (SEIS). Full details of all the recent pension changes. How to obtain much more tax relief from your pension contributions. A whole chapter covering tax exemptions and amounts that are completely tax-free. 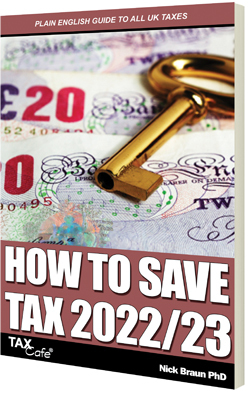 All in all this guide is crammed full of tax saving tips that could save you thousands of pounds. Dr Nick Braun founded Taxcafe in 1999. Over the past 19 years the company has become one of the UK's best-known tax publishers and has won several prestigious business awards. Nick has been a specialist tax writer since 1989, first in South Africa where he edited the monthly Tax Breaks publication, and since 1999 in the UK, where he has authored several tax books. Nick also has a PhD in economics from the University of Glasgow, where he was awarded the prestigious William Glen scholarship and later became a Research Fellow. We are currently providing a FREE electronic (PDF) copy of How to Save Tax 2019/20 when you purchase any of our other tax guides.